My slightly crazy aim was to be the first football fan to watch top division league football in all 55 UEFA nations in one season. I completed my football mission in Montenegro on 28 April 2018. My ultimate goal was always to document this fusion of creaking trains and strained limbs. 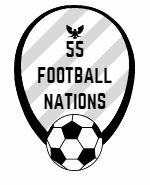 And the 55 Football Nations book will be published in June 2019! I explained the reasons behind my challenge live from IFK Mariehamn’s Wiklöf Holding Arena. Europe is the richest vein of football’s expanding body. The UEFA family now covers 55 members from traditional heavyweights to more recent upstarts Gibraltar (affiliated in 2013) and Kosovo (2016). League football forms the backbone of European football, attracting crowds of over 170 million each season. I watched a live football match in all of these lands, covering the top national leagues in places as diverse as the Faroe Islands, Israel and Kazakhstan between June 2017 and April 2018. I interviewed fans at many of the matches I attended. These are the supporters that remain the lifeblood of the European game and a rich source of information and entertainment for the forthcoming 55 Football Nations book. Why complete 55 Football Nations in one season? Football and the world are changing faster than I can type. There is a new immediacy that makes experiences live short in the memory. 55 Football Nations provided democracy and a rare consistency. All the leagues, teams and supporters were experiencing football over the same 2017-18 season. A season that, like my travels, ended at the World Cup in Russia. It was also a challenge! Was it possible become the first person to complete 55 Football Nations in one season and write a narrative based on it? This was a project inspired by the meanderings of Paul Theroux, Jonathan Wilson and Bill Bryson and the lunacy of Tony Hawks’ “Round Ireland with a Fridge.” It was difficult to predict the hurdles I would face but they were more likely to be due to foggy postponements or political instability than electrical. The full 55FN schedule is available – 79 top division league matches in 55 UEFA nations over one amazing season. Liechtenstein are the only UEFA member without their own league as their teams play in the Swiss League. FC Vaduz, the sole representatives from Liechtenstein, were relegated from the 2016-17 Swiss Super League. 55 Football Nations covered 55 football leagues, all of the 54 top divisions and FC Vaduz in the Swiss second division. How do I become part of 55 Football Nations? You can receive the latest updates from the 55 Football Nations website by joyfully substituting Cristiano Ronaldo beneath the green penalty box. Please also follow 55 Football Nations on Instagram, Twitter or Facebook.